On Day 16 of the Aadhaar hearing, senior counsel P Chidambaram, appearing on behalf of Congress leader Jairam Ramesh, one of the petitioners, resumed his argument that Article 110(3), in so far as it provides that the decision of the Speaker of the Lok Sabha as to whether a Bill is a ‘Money Bill’ shall be final, does not exclude the scope of judicial review. Sub Committee on Judicial Accountability v. UOI (1991), whereunder it was held, “It is not correct to say that the question whether a motion has lapsed or not was a matter pertaining to the conduct of the business of the House, of which the House was the sole and exclusive master, and that no aspect of the matter was justiciable before a Court...On an interpretation of the Constitutional provisions as well as the Judges (Inquiry) Act, 1968, the Courts retain jurisdiction to declare that a motion for removal of Judge does not lapse on dissolution of the House... The scheme of Articles 124(4) and (5) is that the entire process of removal is in two parts - the first part, under clause (5) from initiation to investigation and proof of misbehaviour or incapacity is covered by an enacted law, Parliament's role being only legislative as in all the laws enacted by it, the second part under clause (4) is in Parliament and that process commences only on proof of misbehaviour or incapacity in accordance with the law enacted under clause (5)”. Raja Ram Pal v. Speaker (2007), wherein, in construing whether the Parliament is empowered to expel a member under Article 105(3), it was observed, “...the decisions taken, orders made, findings recorded or conclusions arrived at by Parliament/State Legislature are subject to judicial review, albeit on limited grounds and parameters. If, therefore, there is gross abuse of power by Parliament/ State Legislature, this Court will not hesitate in discharging its duty by quashing the order or setting aside unreasonable action”. Kihoto Hollohan v. Zachillhu (1992), whereunder it was held, “The legal fiction in para 6(2) of the Tenth Schedule brings a proceeding under para 6(1) within the ambit of clause (1) of Article 122/212 of the Constitution, and, therefore, makes it justiciable on the ground of illegality or perversity inspite of the immunity it enjoys to a challenge on the ground of ‘irregularity of procedure’”. Paragraph 6 of the Tenth Schedule deals with the power of the Speaker or the Chairman, as the case may be, to decide on the disputed disqualification of a Member of the Parliament. Mohd. Saeed Siddiqui v. State of UP (2014), wherein the apex court rejected the challenge that the UP Lokayukta and Up-Lokayukta (Amendment) Act of 2012 was wrongly introduced as a Money Bill in clear disregard to the provisions of Article 199 of the Constitution, holding that the Speaker’s decision is final. Chidambaram on Tuesday submitted that in the said case there was no deliberation on why the Act was introduced as a Money Bill. In addition, the Supreme Court judgments in Yogendra Kumar Jaiswal (2015) and MSM Sharma v. Dr Shree Krishna Sinha were also discussed. Expressing doubts regarding the relevancy of the aforesaid judgment, Chidambaram proceeded to discuss how the introduction of the Aadhaar Act of 2016 as a Money Bill strikes at the federal character of the Constitution in so far as the Rajya Sabha has been bypassed. In the same context, he relied on the Supreme Court judgment in Kuldip Nayar v. UOI (2006). In the light of the meaning of Money Bill under the Constitution of Ireland, envisaged as being one which deals “only” with taxation, appropriation of or charge on public money or loan raised by the state, the senior counsel emphasised on the restrictive nature of what qualifies as a Money Bill. He drew the attention of the bench to the debated in the Rajya Sabha on the Aadhaar Act and the modifications suggested thereto by Jairam Ramesh which was adopted by the Upper House, but eventually the Act of 2016 was passed in its original state. Referring to the Long Title and the Preamble of the Act of 2016, the senior counsel submitted that it has been sought to bring the Act within the purview of clauses (c) and (g) of Article 110(1). “What are the provisions in the Act of 2016 which attract the clauses of Article 110(1),” inquired Justice DY Chandrachud. 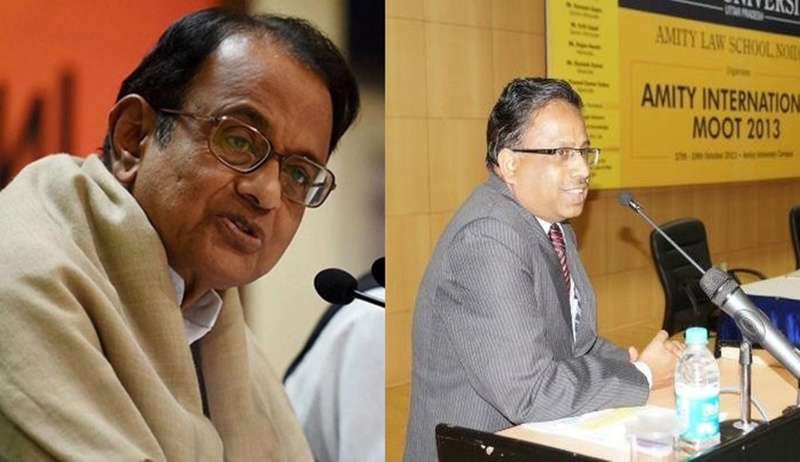 “The issue is if there are provisions of the Act which do not bear a relation to any of the clauses of Article 110(1), for a Money Bill may not contain such provisions,” responded Chidambaram. He drew the attention of the bench to phrase ‘other purposes for which Aadhaar may be used’ in sections 23(1)(h) and 54(2)(m) dealing with the functions of the UIDAI and its power to make regulations, respectively. It was his argument that by virtue of the said provisions and Section 57 of the Act of 2016, the Act cannot be said to be a Money Bill but only a Financial Bill. In response to a query in that behalf by Justice Chandrachud, Chidambaram responded that provisions of the Aadhaar Act relatable to Article 110(1) could not be severed from the rest of the Act and saved. In the same context, he referred to Article 55 of the Constitution of Australia which states that “laws imposing taxation shall deal only with the imposition of taxation, and any provision therein dealing with any other matter shall be of no effect”. Thereupon, senior counsel KV Viswanathan commenced his arguments directed at: (1) the gathering, storage and utilisation of sensitive, personal information; (2) the constitutionality of Section 59 of the Act of 2016, which provides that all actions taken prior to the coming into the force of the Act shall be deemed to have been validly taken under the Act; and (3) the mandate of Aadhaar under section 7 acting as an instrument of exclusion in respect of ‘Subsidies, Benefits and Services’. “Section 59 provides that anything done or action taken between January 28, 2009 (the setting up of the UIDAI) and 2016 shall be deemed to have been done only in 2016 after the coming into force of the Act... hence, there is no retrospective validation,” noted Justice Chandrachud. “The Act operates on the notion that the right to privacy is not a Fundamental Right. Section 59 is violative of Articles 14 and 21,” remarked Viswanathan. At this point, senior counsel Arvind Datar raised concerns regarding the mandate of Aadhaar for the issue of ‘tatkal’ passports, referring to the interim orders of the apex court, the most recent being the one dated December 15, 2017. He also requested the bench to consider the extension of the March 31 deadline for compulsory Aadhaar linkage with mobile phones, bank accounts and other services. Attorney General KK Venugopal explained that while other ID proofs were acceptable for the issue of passports, the mandate of Aadhaar was merely in respect of its speedy issue under the ‘Tatkal’ scheme. He also requested that any extension of deadline may not affect the ‘subsidies, benefits and services’ under Section 7 of the Aadhaar Act. The five-judge Constitution bench of the Supreme Court on Tuesday extended the deadline for mandatory linkage of Aadhaar number with bank accounts, mobile numbers and other services till the disposal of petitions challenging the constitutional validity of the Aadhaar (Targeted Delivery of Financial and Other Subsidies, Benefits and Services) Act, 2016, clarifying that the extension shall not be applicable to the ‘subsidies, benefits and services’ under Section 7 of the Act.